Artistic director Bevan Keating served as director for the Arts to Go! program at Wildwood Park for the Arts during the early summer of 2015. His lighthearted production of The Bremen Town Musicians was a crowd pleaser as it toured schools across the state, entertaining students and introducing them to the melodies of Rossini, Sullivan, Verdi, and more! Our most moving production to date told the tragic story of Queen Dido of Carthage and Prince Aeneas of Troy, two star-crossed lovers whose power and nobility cannot protect them from the evil machinations of the gods and a local coven of witches. Praeclara once again collaborated with choreographer Rebecca Stalcup and the dancers of Arkansas Festival Ballet to portray Purcell’s characters in both song and dance. Julia Aronson and Matthew Morley returned to dance the roles of Dido and Aeneas, while mezzo-soprano Kathryne Overturf and baritone Tim Tucker sang the parts of the ancient royals. 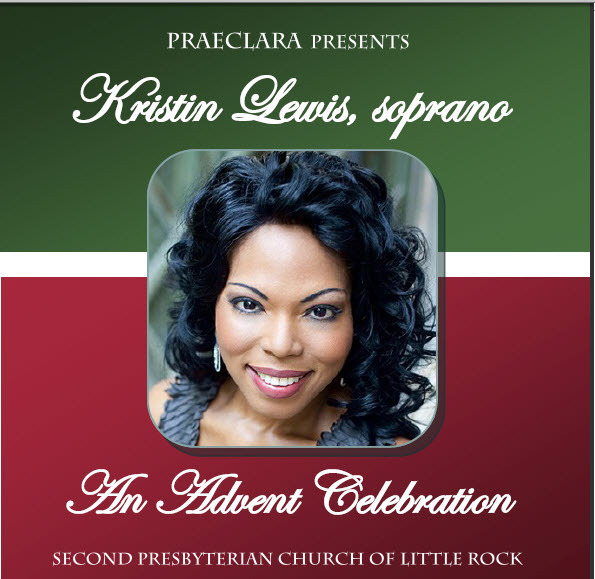 A perennial Christmas favorite, Handel’s Messiah was even more breathtaking in the candlelit sanctuary of Second Presbyterian Church of Little Rock. Dramatic processionals and lighting changes played a role in this innovative interpretation of this classic masterwork, supported by the vocals of nearly 150 choir members and the solo performances of Shannon Rookey (soprano), Kathryne Overturf (mezzo-soprano), Matthew Tatus (tenor), and Tim Tucker (baritone). Praeclara was proud to host international opera star Kristin Lewis‘s first benefit concert for her new vocal scholarship foundation, which enables young singers between the ages of 18 and 23 to polish their craft through additional training and travel. 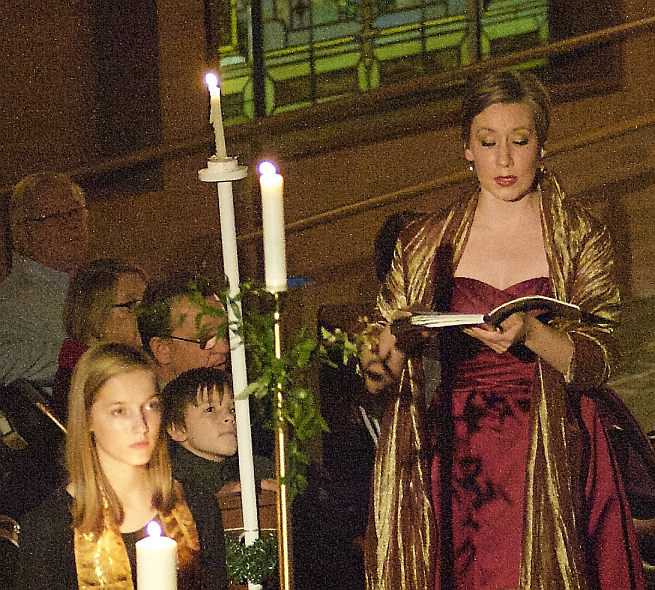 Kristin lit up the sanctuary at Second Presbyterian Church of Little Rock, where she formerly sang as a section leader in the choir before moving to Tennessee and then Vienna, Austria to pursue her studies. Her beautiful renditions of a program of Christmas favorites were inspirational, and the donations she received after the performance funded five scholarships for the finalists of her first scholarship competition in the summer of 2015. The production that literally started it all, Carmina Burana marked the first large-scale collaboration between artistic director Bevan Keating, producer Bruce Rentz, and choreographer Rebecca Stalcup. The team had seen many interpretations of Carmina Burana: some staged as a traditional cantata with choir and soloists, some staged with soloists who acted out their roles, still others staged entirely as a ballet — but none that mixed both choral and dance performance in the way that Carl Orff originally imagined for his work. In April 2014, nearly 300 singers, dancers, and orchestra players took the stage at the Maumelle Performing Arts Center to bring Carmina Burana to life in a brand new way, featuring an original libretto developed by Keating and Rentz and exclusive choreography developed by Stalcup. 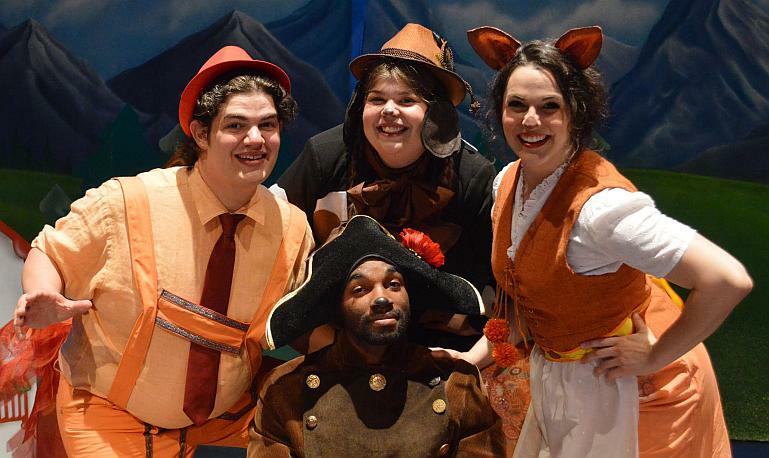 The Bremen Town Musicians — Caitlin Secrest as Dorabella, Georgeann Yehling as Barcarolle, Luke Angelo as Eddie Pensier, and Todd McNeel as General Boom; photo by Sofia Gonzalez. 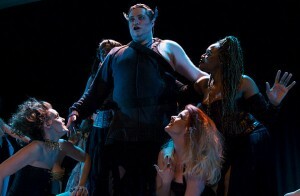 Dido and Aeneas — Matthew Tatus, Kira Keating, Shay Watson, Satia Spencer, and Shea Williamson as the sorcerer and his coven of witches; photo by Steven Veach. 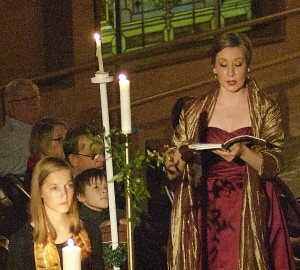 Messiah by Candlelight — Kathryne Overturf, mezzo-soprano; photo by Joe Henry. Kristin Lewis: An Advent Celebration — Kristin Lewis photo courtesy of http://www.kristinlewis.de/pressphotos; program cover design by Karen Kuralt. Peter Grimes — Matthew Morley as Peter Grimes and Paula Mallory as the sea goddess Calm; photo by Jon Marbaise. Carmina Burana — Anthony Bryant as Richard and Caroline Young as Celeste; photo by Kelly Hicks.